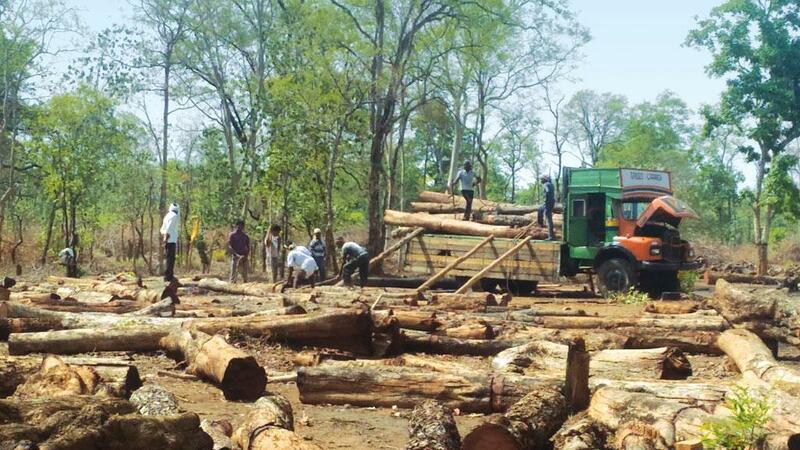 With complete disregard for people’s rights, the Forest Development Corporation of Maharashtra Ltd (FDCM) felled thousands of trees in Brahmapuri forest division early this year. It felled the trees despite protests by the residents of 22 villages located in and around the forest. FDCM did stop felling in June after the monsoon arrived. But by then, it had already cleared 385 hectares (ha) of the old-growth forest to raise teak wood plantations. As a mark of protest, the residents refused to provide labour for planting teak, and FDCM had to hire labour from other districts. 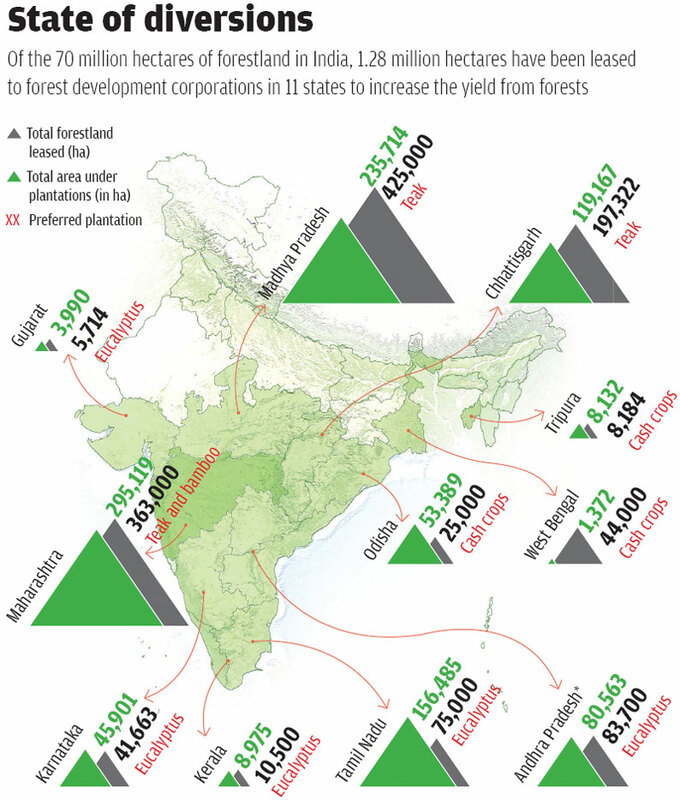 Forest development corporations (FDCs)have been set up since the 1970s in 19 states with the objective of increasing yield from forests through forestry programmes. As per FDCM’s Working Plan for 2015-16, it was to fell 690 ha in Brahmapuri forest, or 210,000 trees, and plant 1.55 million teak trees on the cleared patch. What irked the residents is the mindless felling of healthy trees in old-growth mixed forests of Brahmapuri, and the high-handedness with which FDCM was implementing the plan. Communities in these villages, which fall in Gadchiroli district, claim that they have traditionally depended on the Brahma puri forests for food and livelihood, and thus have community rights over the forest resources. At least 12 villages have filed community forest resource (CFR) rights claims under the Forest Rights Act, 2006. Some had filed the CFR claims way back in 2011. But the forest department allotted forestland to FDCM without settling their CFR claims. And FDCM started felling trees with scant regard for gram sabha resolutions against its activities. (See ‘Rights undermined’). Most PROTESTING villages in and around Brahmapuri forest division are governed under the Panchayat (Extension to Scheduled Areas) Act, 1996 (PESA), where gram sabhas have the right to manage forest resources. Empowered by this right, Vihirgaon gram sabha in 2011 filed Community Forest Resource (CFR) rights claims over 312 ha of forests in its customary village boundary. But it received title deed over 252.56 ha. While the gram sabha's appeal to review the title deed is pending with the State Level Monitoring Committee, the forest department in 2014 allotted the remaining area to the Forest Development Corporation of Maharashtra Ltd (FDCM). Sawalkheda village had filed CFR claims over two forest compartments that lie in its traditional boundary. While it received title deeds for one compartment, the forest department allotted the other compartment to FDCM. The story is similar for other villages, including Shirpur, Yerandi, Mortola and Karadi, who allege that the forest department undermined their CFR rights to lease out a large chunk of the dense forest to FDCM. Dongargaon and Pathargota villages had filed CFR claims over two compartments. Both the compartments were leased out to FDCM without settling the claims. Hiraman Mukunda Garate, deputy sarpanch of Dongargaon, filed a public interest petition in April 2016 in the Nagpur bench of the Bombay High Court. Initially, the court ruled in the favour of the communities but later vacated its order and transferred the case to the National Green Tribunal in Pune. Besides, PESA requires that no activity in the traditional boundary of a village can be carried without the consent of gram sabha. But FDCM did not inform the gram sabhas before felling trees in Brahmapuri forests, let alone seek their consent. In fact, In a letter to the tehsildar of Kurkheda, FDCM stated that the protesting villages, including Sawalkheda and Shirpur, are not governed under PESA. Activists say FDCM's claim is false. To assert their rights, Sawalkheda residents in April 2016 confiscated wood cutting machines of FDCM and lodged a police complaint against it. Instead of recognising the rights of the gram sabha, the police made Sawalkheda residents write a declaration that they would not disrupt the corporation's activities in the future. "Any category of forest or land that supports the livelihood of people should not undergo a change without the consent of people dependent on it," says Neema Pathak Broome of Pune-based environmental action group, Kalpavriksh. Rights under the Forest Rights Act, 2006 are already recognised on land where CFR claims have been filed. "The forest department should not have allotted the land to any other agency until the claims were settled. In PESA areas, nobody can override gram sabha's power to manage their forest resources," she adds. The community’s biggest concern is that replacing natural forests with commercial plantations will severely affect their liveli hood and destroy the region’s ecosystem. People in the protesting villages say they had never seen such tree felling before. As a general practice, the forest department removes only dead and dying trees. But FDCM cut down everything on the 385 ha forest patch, barring a few trees, they say. As per its guideline, FDCM retains 40 trees of fruit bearing and superior species, such as sandalwood and khair (Acacia catechu) in a hectare of forest. This means as long as 40 such trees are retained in a hectare, all other trees can be removed indiscriminately. When asked whether the felling by FDCM is justified, P S Rajput, Deputy Conservator of Forests, Brahmapuri forest division, said, “forests need to be clear-felled for teak plantation as the tree requires ample sunlight. Besides, our objective is to convert low-value forests into high value ones.” Value, in this case, is measured purely in terms of revenue generation. However, the forests deemed as “low value” by FDCM are actually old growth and often dense with mixed tree species like ain (Artocarpus hirsutus), dhawada (Anogei ssus latifolia), bija (Pterocarpus marsupium), shisham (Dalbergia sissoo), khair (Acacia catechu), tendu (Diospyros melanoxylon), amla (Emblica officinalis) and behera (Terminalia bellirica). These species are part of an ecosystem that provides a range of ecological services other than being a source of sustenance and livelihood for communities. For forest-dependent people, the rich ecosystem provides medicines, food, building materials and non-timber forest produce, but teak plantations would rob them of their livelihood sources. Bhaskar Dadmal, secretary of the Van Sahniyantran Samiti of Sawalkheda village, explains citing the utilities of mahua tree (Madhuca longifolia). Its fruits are eaten by birds and mammals, seeds are used to make oil and the residues are fed to livestock. Mahua flowers can fetch Rs 45,000 annually on an average, Dadmal says. On the other hand, he explains, a full-grown teak tree may provide a one-time revenue of around Rs 100,000, and that too only at the time of harvest, 60 years later. Worse, the commu nity is not entitled to the benefits from the harvested teak. FDCM, which has monopoly over the plantations, works on the principle of creating employment but not sharing the benefits with the people. So even though the community can find employment by working as labourers at the time of planting and harvesting, they doubt whether the loss of forest-based livelihood can ever be compensated by plantation-based livelihood. To find a middle ground, the community had offered degraded forestland within the traditional boundaries of their gram sabhas, but FDCM turned down the offer saying the land is not suitable for teak plantation. One cannot dismiss the people’s concerns about the depleting water table and soil quality as studies show that commercial plantations can cause irreparable damage to the ecosystem through replacement of natural and seminatural habitats, possible changes in the availability of water in catchment areas, soil erosion and chemical contamination. Studies also show that plantations raised after deforestation cause additional damages in the form of biodiversity loss and loss of habitat for wildlife. However, there is no mechanism in the country to assess the environmental impacts caused by converting complex forest ecosy stems into commercial plantations. Instead, such plantations are classified as “forestry activity” and, therefore, do not require environmental or social impact assessments or obtaining forest clearances. Forests are not considered “diverted” in such cases, but “transferred” from one agency to another. In the absence of any guidelines for social and environmental impact assessment for conversion of forests into plantations, FDCs have been let off the hook. There is also no clear-cut criterion to decide which forestland should be transferred to FDCs for raising plantations. FDC officials claim that they are allotted forests that have less than 40 per cent canopy cover, but there have been cases where denser forests have been handed over to FDCs. Several compartments in Allapalli and Ghot forest ranges allotted to FDCM have more than 40 per cent density, suggests a letter by the Maharashtra government to the forest department, dated April 28, 2014. There is an urgent need for guidelines as 1.28 million ha of the country’s 70 million ha forest cover has been leased to FDCs in 11 states. While eight FDCs are raising plantations of timber and pulpwood (eucalyptus and bamboo), the remaining grow cash crop plantations (see ‘State of diversions’). “The activity of converting forestland into plantations should be regulated under the Forest (Conservation) Act of 1980,” says Ajay Kumar Saxena, Programme Manager- Forestry at Delhi-based non-profit Centre for Science and Environment. “This will ensure that the conversion is considered as a diversion of forests, thereby mandating scientific study about the impacts of such processes before they get approved by the government.” Saxena suggests that instead of converting forests into commercial plantations, FDCs should focus more on making degraded forests and wastelands productive. India should also learn from countries, such as Vietnam and Malaysia, which have managed to minimise the environmental and social impacts of plantations. Vietnam recognises that plantations are more like agricultural systems than forests, and has guidelines in place for forest plantation management, which require that diversity of genetic materials, species and age classes are incorporated in the working plan. Their site selection mandates that local communities do not depend on the patch for non-timber forest produce and livestock grazing, nor does it hold cultural and spiritual significance for them. Similarly, in 2000, Malaysia released environmental impact assessment guidelines for oil palm plantations. Detailed reports on environmental and social impacts of industrial plantations are also being prepared in Sierra Leone and Cameroon. It is a scientific fact that plantations on forestland do not restore the ecosystem functions of original natural forests even after hundreds of years. Thus, the decision to transfer forestland for any purpose, including plantations, should not be taken without the consent of all stakeholders and a rigorous scientific impact assessment. India’s forests are its natural capital, and any non-forest activity on the forestland needs careful scientific scrutiny before approval. The commercial purposes by state for so called social welfare are harming the society and ecosystem.i think under the name of increasing forest cover and also for commercial purpose,if this practice continues then soon there will be situation where we will say that we have a required forest cover but with minimum biodiversity.